A Symposium on Cultural Participation was held on the 21st June, presenting the main findings from a nationwide survey held in 2016. 91% of Malta’s adult population participated in a cultural activity according to new statistics on cultural participation in 2016 released by Arts Council Malta. The population survey carried out by the National Statistics Office in collaboration with the Valletta 2018 Foundation gives a statistical snapshot of several characteristics associated with the involvement of people in cultural activities. The 2016 findings reveal an overall increase in participation across a number of activities when compared to the 2011 survey. The survey also reveals levels of participation by age, region and level of education completed. The highest percentage point increase and largest attendance was registered for parish feasts with a 67% attendance. The lowest participation was in dance with a 12% attendance. Cinemas registered an attendance of 42%, historical sites 35% and museums 30%. Theatre attendance stood at 32% with comedy registered as the favourite genre and concert going registered an attendance of 32%. Pop music remains the predominant preferred music interest of the respondents. 44% read at least one book, with romance as the favourite genre and 20% visited a library. 70% of those with access to internet used the internet to listen to music, 66% to read newspaper articles and 61% to find information about a local cultural event. The survey also reveals that 37% of the population is active in a variety of cultural activities ranging from involvement in traditional festivities such as carnival to artistic activities such as playing an instrument or painting. This group of respondents also scored higher on the life satisfaction scoreboard than those who did not actively participate in cultural activities. Research on attitudes, preferences and perceptions to cultural life in the survey provides an insight on why people choose to participate – or not – in cultural activities. 57% agreed that other commitments in their life prevent them from having enough time to go to arts or cultural events and 31% believe that most people are socially excluded from cultural opportunities. Whereas 62% agree that taxpayers’ money should be used to finance arts and cultural initiatives, 30% would be willing to volunteer time to support an arts or cultural organisation and 32% agree that the arts and culture and essential to their life. As part of the research project, Arts Council Malta also commissioned a selection of critical essays by 10 contributors with expertise from different fields. In addition, based on the results of the survey, an audience segmentation report was created by international cultural strategy and research agency Morris Hargreaves McIntyre. 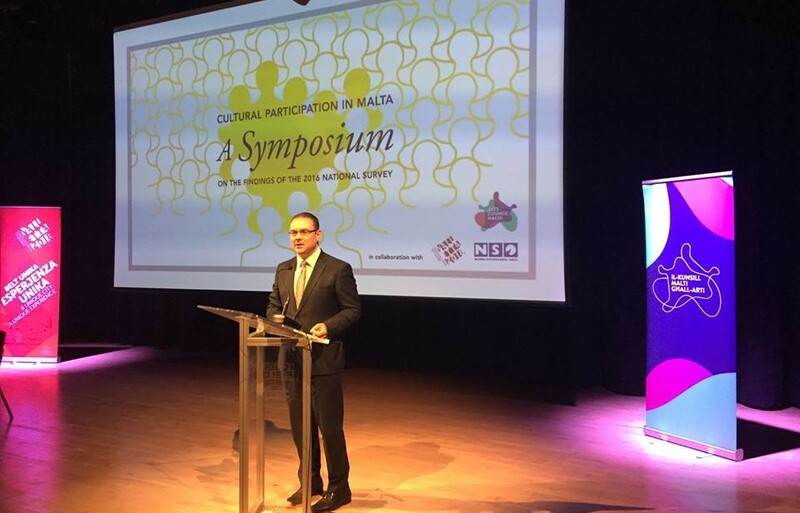 The report reveals that the current culture market in Malta – those who have visited a cultural event in the past three years – is comparable to other developed nations. 76% of those in Malta are in the current culture market. While lagging behind the clear leader New Zealand (98%), this is not dissimilar to other developed nations such as the UK (85%), Germany and Israel (both 84%). It is also significantly higher than the likes of India (24%), Turkey (20%) and Brazil (16%).